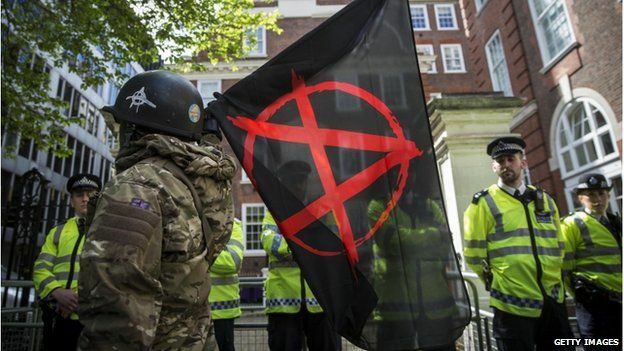 Seventeen people have been arrested following clashes with police during an unplanned anti-austerity protest close to Downing Street, the Met police said. 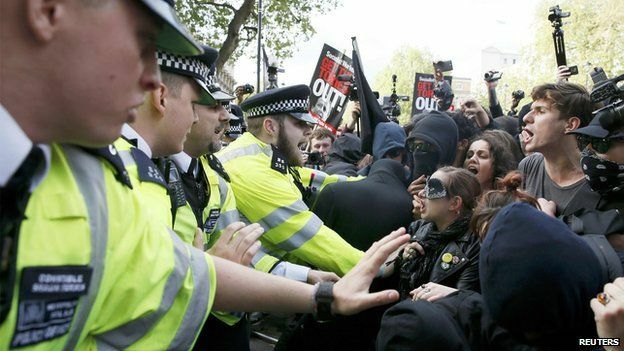 Officers in riot gear clashed with a “minority” of protesters who threw objects during the rally – which came after the Tory election victory. 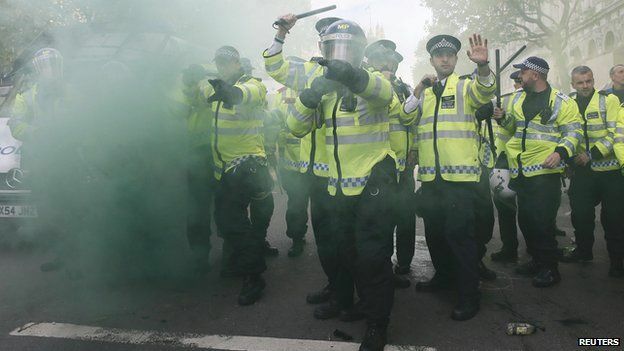 Four police officers and a police staff member were injured, the Met added. A police investigation is also under way after graffiti referring to “Tory scum” was daubed on a war memorial. The graffiti was sprayed on the Women’s War Memorial, in London’s Whitehall, which is yards from where a concert to commemorate the 70th anniversary of VE Day took place on Saturday. A Downing Street spokesman condemned the graffiti as “a despicable display of disrespect for those who fought and died for their country”. 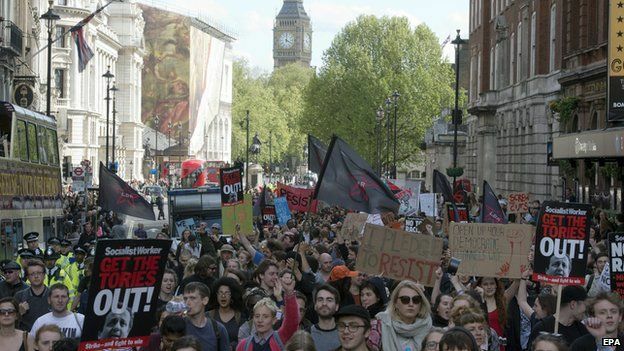 Hundreds of anti-government protesters, some holding placards reading “I pledge to resist” and “Stop the cuts”, took part in the rally on Saturday, which began outside Conservative Party headquarters. In a statement, the Met said the arrests were made for a variety of offences, including violent disorder and assault on a police officer. Among the objects thrown at police were traffic cones and smoke bombs. One officer suffered a dislocated shoulder and a police staff member was hit in the mouth by an object, the force said. Both were being treated in hospital. Three other officers were assaulted but did not go to hospital, police added. There have been no reported injuries to any protesters. 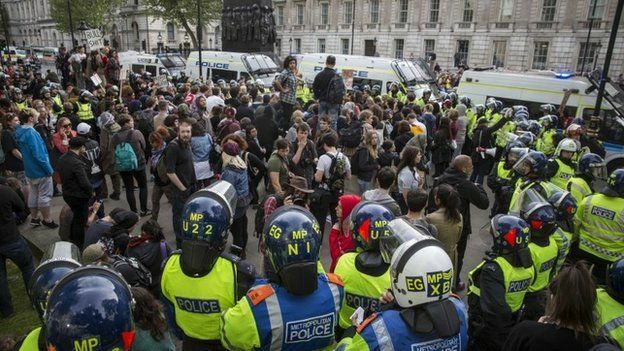 Ch Supt Gerry Campbell said the “vast majority” of protestors had taken part peacefully, but added that a “small minority” had been intent on causing disorder. “We have launched an investigation into criminal damage to the Women in World War Two Memorial. This is particularly abhorrent considering we are celebrating the 70th anniversary of VE Day,” he said. 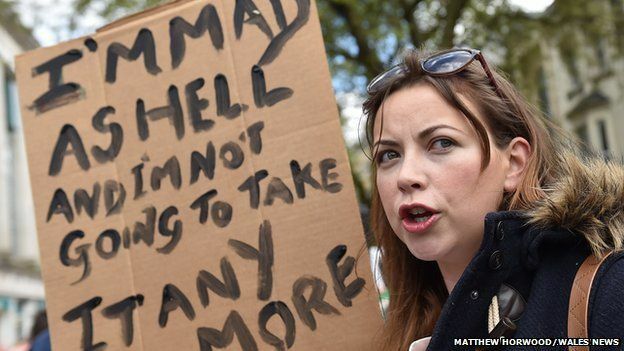 In Cardiff, about 200 people joined a similar rally against austerity – where singer Charlotte Church carried a placard saying she was “mad as hell”.